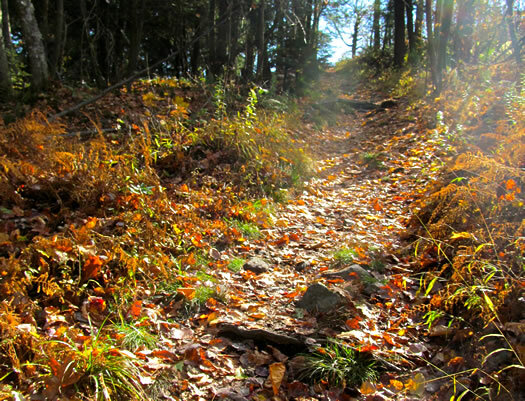 I was wondering if your readers could weigh in with their favorite Fall Hikes. Some friends of mine are coming to town and I'd really like to "wow" them with a spectacular view. We're willing to drive up to the Adirondacks, down to the Catskills and anywhere in between! We've touched on this topic a little bit before, but we're always up for hearing about good/fun places to hike this time of year. Got a favorite to share with Sean and the rest of us? Please share! Bonus points for a line or two about why you like that spot. Indian Ladder (also mentioned in the comments on the older post) has nice views, you can see the whole city of Albany from afar (from SUNY all the way to ESP/Downtown). Overlook Mt in the catskills is great it has an abandoned hotel, a fire tower, and is right across from a cool monastery. You can also hit up Woodstock during the trip. To date, my two favorites have been Mt. Jo up near Lake Placid and the Hadley Fire Tower. Both offer tremendous views for relatively low effort. You can get up there, hike, spend some time at the peak and still come home with 1/2 a day remaining. Buck Mountain on Lake George has great views of the lake from the summit. It's a relatively easy hike at 6 miles round trip. If your friends are in excellent shape, Giant Mountain in the Adirondack offers a more strenuous 6 mile hike with great views of the high peaks region. I like hiking Bald Peak from Rt. 9 near Elizabethtown during the fall season. The trail breaks out into the open relatively quickly, with consistent views back down the valley. It is a tough hike, but the trail is good - just make sure to bring plenty of water, as there are limited water sources on the ridge. The trail does not end at Bald Peak, so if you have an experienced group, you could follow it all the way to Giant Mtn (over Rocky Peak Ridge). I.e. if you have 2 cars, you could spot one at the Giant trailhead, and another at the Rt. 9 trailhead. Hard 1 -Santanoni Mt (High peaks) even on a weekend you can do this in relative peace. I was there last Sunday and saw maybe 10 different people all day. Hard 2 -Haystack Mountain (High peaks) 17+ mi round trip maybe too long for some but damn does it have a great view! If you wanna go big or go home, do the Dix Range (High peaks) as a dayhike. 5 peaks and about 18 mi but its not too hard for me at least. Excellent foliage at Camp Little Notch! Gentle hike to historic iron blast furnace or around pristine private lake. Families and all people welcome. Christman Sanctuary Nature Conservancy is truly beautiful. the Mohawk Hudson Land Conservancy also has a great selection of out-of-the-way places to hike through: http://mohawkhudson.org/our-preserves/find-a-preserve/. Best view I've ever had, after about ten years of hiking in the Adirondacks, is from Hurricane Mountain. You can see so many mountains. It's truly amazing. The hike is *not* easy but it is worth the trek. There is a fire tower but I don't think you're allowed to climb it again yet. Noomark has beautiful views, especially of the Great Range in the High Peaks of the ADKs. Catskills are close (45-ish minutes). There, Kaaterskill Falls is nice at the top and the bottom (there are two separate trails), as is Minnewaska State Park. Or you could always go during a weekday to the Corning Tower Observation Deck in downtown Albany. At 44-stories, it's the tallest skyscraper in NYS outside of NYC. If you want a hike, skip the elevator. Five Rivers in Delmar has a lot of nice trails, ponds and streams. I was just a Mount Greylock in Mass. Beautiful vistas of the Berkshire foliage. I can agree with the above comments- Overlook Mountain in Woodstock is super easy with great rewards. Hadley Mountain is a quick trip, also with a fire tower, and wonderful views. Big Slide Mountain up in the Adirondacks is a longer hike but has views for the majority of the trip up = worth it in my book! And when you're out of the woods, it's a quick drive down Route 7 to Baba Louie's in Great Barrington. I second Indian Ladder and Mount Jo! Indian Ladder is really more of a nature walk, not at all challenging but super scenic... definitely has that "wow" factor! Plus it's local, and you can get some apples, cider donuts, and other autumn goodies at Indian Ladder farm on your way home. Mount Jo in Lake Placid is my absolute favorite Fall hike. It's not a huge mountain (great for kids, or for folks who might be a little out of shape) but you'll definitely get the most "bang for your buck" in terms of the view. Heart Lake is beautiful from the top! I think the leaves are past peak in the Adirondacks now, but it's seriously a gorgeous hike with two unique routes (so you can take one way up and the other way down). Also, Lake Placid is a lot of fun... and we also enjoy stopping in Saratoga Springs on our way home. Camp Little Notch in Fort Ann, NY is having a Black Friday open house with hikes to the Mount Hope Iron Furnace - work off that pie!